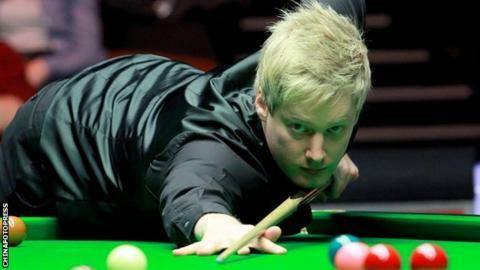 World number one Neil Robertson said any opponent in this year's World Championship was going to feel the backlash from the disappointment of his early exit last season. The 2010 champion was in imperious form as he wrapped up a merciless 10-2 win over qualifier Robbie Williams. Robertson led 7-2 overnight and scored two centuries as he raced to victory. Robertson is one of only three non-British players to have won the World Championship. Canadian Cliff Thorburn and Ireland's Ken Doherty are the other two. Robertson has now scored 97 centuries this season, beating the previous best of 61 which was set by Judd Trump last season. Ding Junhui has also bettered Trump's record. "Whoever I played was going to feel the wrath of some of my best snooker," the Cambridge-based Australian said. Robertson, who was beaten by Robert Milkins in the first round at the Crucible in 2013, said he wanted to "destroy" his opponent. "It was one of those matches where I was really determined to do well to make amends for last year," Robertson added. "He started off well with a 50, but then I cleared up and made a 140 [the highest break of the tournament so far] and a 100. It is the sort of the snooker that is required to win the World Championship this year. "This is the best World Championship I have prepared for in terms of practise and how I feel leading into it." Robertson, 32, took only 44 minutes to seal victory as he won all three frames of the second session to set up a second-round meeting with Mark Allen. "This is the definitely best season I have ever played," he said. "I have won two ranking titles but I should probably have at least four with how well I have played. "It would be a bit disrespectful, with all the fantastic players out there, to say you are unhappy, but with how well I have played I feel I should have won more." Robertson's remarkable season also sees him closing in on a landmark 100 centuries for the season. His match-sealing ton against Williams was his 96th so far. "Everyone remembers the first sportsman to achieve a certain record," the Australian said. "The fact I am the first to make 70, 80 and 90 is already good enough really. "But it is one I would love to do, absolutely no doubt about it. If I have a really good run then I could perhaps crack a hundred." Robertson said he was looking forward to his best of 25-frame meeting with Allen in the last 16. "Mark is one the of the toughest draws you get in the last 16," Robertson said. "He is a really attacking player and we have had a lot of really good matches. "I really like the way he plays. He plays quick, scores heavily and is good to watch. He's a brilliant player and a really good lad as well."